Colin Kaepernick might win his NFL collusion grievance because of Trump’s big mouth. The president may be key to the quarterback winning his collusion grievance. Colin Kaepernick walks to the field before a game against the Los Angeles Rams at Los Angeles Memorial Coliseum on Dec. 24. Colin Kaepernick’s accusation that NFL owners have colluded to keep him out of the league feels true. As more starting NFL quarterbacks get hurt and more obviously inferior quarterbacks get jobs that might have gone to the former San Francisco 49ers QB, the evidence seems clearer and clearer that he is being blackballed. But to win the grievance he filed against the league on Sunday, Kaepernick must prove collusion has taken place. Per the league’s collective bargaining agreement, he needs to demonstrate that two or more NFL teams, or one or more team and the NFL itself, acted in concert through an “express or implied” agreement to limit his employment options. The owners … have been quoted describing their communications with President Trump, who has been an organizing force in the collusion among team owners in their conduct towards Mr. Kaepernick and other NFL players. Owners have described the Trump Administration as causing paradigm shifts in their views toward NFL players. What evidence might Kaepernick draw on to make the case that Trump abetted a league-wide collusive effort? First, some teams genuinely believe that he can’t play. They think he’s shot. I’d put that number around 20 percent. Second, some teams fear the backlash from fans after getting him. They think there might be protests or [President Donald] Trump will tweet about the team. I’d say that number is around 10 percent. Then there’s another 10 percent that has a mix of those feelings. Third, the rest genuinely hate him and can’t stand what he did [kneeling for the national anthem]. They want nothing to do with him. They won’t move on. The implication there is that the president had helped persuade 10 to 20 percent of the league—three to six teams—not to sign Kaepernick. The quote also suggests that the general manager had discussed Kaepernick’s employment status with officials from other teams. “[Some teams] think showing no interest is a form of punishment,” the team official said. “I think some teams also want to use Kaepernick as a cautionary tale to stop other players in the future from doing what he did.” If it can be proved that any opposing team officials openly or implicitly discussed retaliating against Kaepernick in this way, that certainly sounds like good evidence of collusion. Shortly after that, Jones said he would bench any player who demonstrated during the national anthem and stated that Trump had reminded him about an NFL policy that encouraged players to stand during the anthem. In the meeting, many owners wanted to speak, but the discussion soon was “hijacked,” in the words of one owner, by Jones, a $1 million contributor to Trump’s inaugural committee fund. … The blunt Hall of Famer mentioned that he had spoken by phone, more than once over the past 24 hours, with Trump. Jones said the president, who only a few years ago tried to buy the Buffalo Bills, had no intention of backing down from his criticism of the NFL and its players. Jones—who a day earlier for Monday Night Football in Arizona had orchestrated a team-wide kneeling before the anthem ahead of rising to stand when it started to play—repeated his refrain that the protests weren’t good for the NFL in the long run. In the days after that meeting, NFL commissioner Roger Goodell backtracked on his public support of protesting players, sending a league-wide memorandum arguing that the “current dispute over the National Anthem is threatening to erode the unifying power of our game.” Goodell also reportedly considered a tweak to the league’s operations manual that would have made standing for the anthem obligatory. It will be up to a neutral arbitrator—reportedly, University of Pennsylvania law professor Stephen Burbank—to determine whether all this information adds up to a strong implicit collusion case. Kaepernick’s legal team, though, won’t necessarily have to rely solely on publicly available evidence. The grievance letter filed by Kaepernick on Sunday puts the NFL and all 32 teams on notice that they “are required by law to preserve all documents, emails, text messages, memoranda, notes, and all other electronically stored information (ESI) which is reasonably calculated to lead to the discovery of admissible evidence in this action.” Finding definitive proof in all of that data might not be necessary to prove collusion, though. Gene Orza, the lawyer who defeated Major League Baseball to the tune of $280 million in an epochal 1980s collusion case, told CNNMoney that a “smoking gun was not the basis of that [MLB] decision. Instead it was simply the inference of collusion, that all of [a] sudden not one player who was a free agent was getting an offer.” The NFL uses a “clear preponderance of evidence” standard in its arbitration, though, and MLB did not at that time. 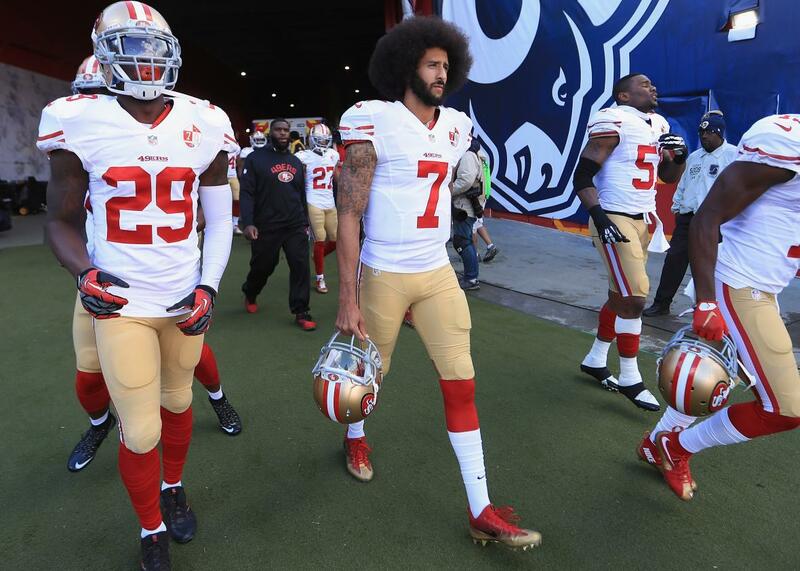 This will make beating the league a heavier lift for Kaepernick, as will the fact that he’s currently the lone player who has allegedly been blackballed and is a legitimately controversial figure. Two years ago, for example, Barry Bonds lost his arbitration proceeding after accusing MLB of colluding to blackball him after controversies surrounding his use of performance-enhancing drugs. NFL teams exhibited unusual and bizarre behavior regarding Mr. Kaepernick’s prospective employment. Multiple NFL head coaches and general managers stated that they wanted to sign Mr. Kaepernick, only to mysteriously go silent with no explanation and no contract offer made to Mr. Kaepernick. Other NFL teams stated they had no interest in Mr. Kaepernick and refused to explain why. NFL teams who ran offensive systems favorable to Mr. Kaepernick’s style of play instead employed retired quarterbacks or quarterbacks who had not played in a regular season game in years, and signed them to significant contracts while prohibiting Mr. Kaepernick from even trying out or interviewing for those jobs. We know the NFL is full of quarterbacks who aren’t as good as Colin Kaepernick. We’ll soon find out if this fact means Kaepernick will emerge victorious in arbitration. Perhaps, it will ultimately be President Trump’s words and deeds that help the quarterback score a huge win off the field.